(Nanowerk News) Researchers from FOM Institute AMOLF and Philips Research have designed and fabricated a new type of nanoscale antenna. The new antennas look like pyramids, rather than the more commonly used straight pillars. The pyramid shape enhances the interference between the magnetic and electric fields of light. This makes the pyramid-shaped antenna capable of enhancing light emission and beaming different colours of light towards opposite directions. This finding could lead to more efficient light emitting devices (LEDs). The researchers publish their results online on 12 December 2014 in Physical Review Letters ("Breaking the Symmetry of Forward-Backward Light Emission with Localized and Collective Magnetoelectric Resonances in Arrays of Pyramid-Shaped Aluminum Nanoparticles"). The figure shows how much light (PLE, photoluminescence excitation) the individual pyramid-shaped antenna emits at various wavelengths (colours) of light in comparison to the antennas in the array. The individual antenna peaks at a wavelength of about 650 nanometer, whereas the antennas in the array peak at about 580 nanometer. The micrograph (top right corner) was made with an electron microscope. The colour of the arrow corresponds to the colour used in the other figure. A straight nanoscale antenna will mainly respond to the electric field of light. This means that the effects of the magnetic field of light, which holds half of the energy of light, are disregarded. For a long time this was not considered as an issue that could be solved, because most of the metals used to fabricate antennas do not respond to the magnetic field of light anyway. This changed recently, due to the rapid developments in metamaterial research. What seemed to be impossible in the past – making antennas that respond strongly to the magnetic field of light — can now be done by structuring metals on the nanoscale. With these ideas in mind, the AMOLF and Philips researchers built the pyramid shaped antenna. By carefully designing the height and inclination of the antenna’s side walls, the researchers found that the response to the magnetic field of light is almost as strong as the response to the electric field of light. After witnessing the described effects in individual nanoscale antennas, the researchers took it one step further and placed multiple pyramid-shaped antennas in an array. The effect that the antennas have on each other turns out to be quite striking. At certain wavelengths (colours) of light, the antennas can couple to each other via the light that is scattered on the surface of the array. This makes the group of antennas more effective in beaming light than the sum of the individual antennas. In addition, the antenna array may operate collectively at one wavelength, while at the same time the antennas operate individually at a different wavelength. Thus, the same array of pyramid-shaped antennas may beam light of a certain colour upward, and of a different colour downward. 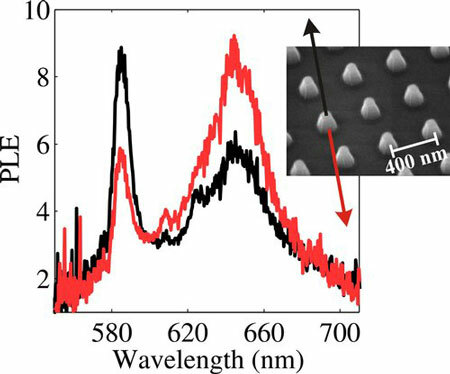 The array of nanoscale pyramid-shaped antennas has great potential for the improvement of LEDs. Currently, many LEDs are designed to emit light in one direction, for instance only ‘upward’. Such LEDs are used for example in automotive lighting or spotlight illumination. Unfortunately, the light emitting material inside a LED emits light with equal intensities both upward and downward. Since only the ‘upward’ emission is useful, the downward moving light needs to be recycled by adding several optical elements, such as mirrors, to the LED. These elements make the LED bulky and less efficient, since some light is inevitably lost during the recycling process. Integrating the pyramid shaped antennas in the LED has great potential for overcoming these disadvantages. The pyramid-shaped antennas are able to selectively beam one colour of light upward. If an undesired colour is present, this can be beamed downward. This development could greatly enhance the efficiency of single LEDs and improve the integration of LEDs in combined light systems.